For one of the best views on St. Thomas, make the drive to the mountaintop perch at Drake’s Seat. Here you can keep lookout over Magens Bay and the British Virgin Islands, just as Sir Francis Drake was said to do from this very spot in order to catch pirates, privateers and invading naval ships approaching from the north via Drake’s Passage, also bearing his name. Today, this lookout point sports a stone platform with a bench atop it, and it’s a popular top for tour groups. The crowds mostly disperse by evening however, making Drake’s Seat an ideal spot to take in the sunset. Drake’s Seat is just a 5-minute drive from the capital and cruise port of Charlotte Amalie, and it’s also a regular stop on most island tours. Visitors coming on their own can avoid the largest crowds by coming early or late in the day. St. Thomas’s Crown Mountain soars to 2,100 feet above sea level. Views here extend toward the British Virgin Islands. Your tour travels to the peak of the mountain and stops at several points of interest along the way, as your guide narrates your trip. At the summit, you’ll take in the views while sipping banana daiquiris. The mountain is also home to duty-free shops selling jewelry, T-shirts, spirits, and souvenirs. Then, explore the mile-long Magen's Bay Beach with its soft white sand and clear blue waters. Immerse yourself in the culture, traditions and history of St John and St Thomas during this 2-day trip. 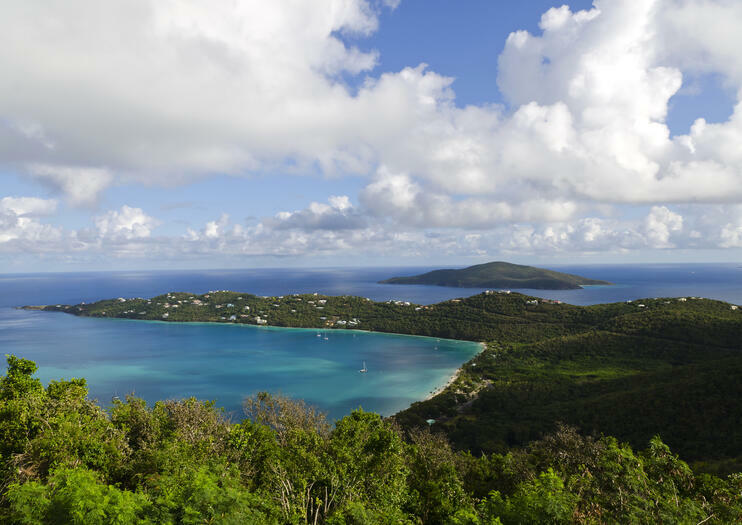 With a local guide, visit sites on both islands like the Virgin Islands National Park and the Annenberg Plantation on St John, as well as Drake's Seat, Skyline Lookout and Mountain Top on St Thomas. Stroll through downtown Charlotte Amelie on St Thomas and take in some sun and surf on St John's Cinnamon Bay Beach. Listen to engaging commentary from your local guide as you travel. Round-trip transportation from St Thomas hotels and lunch on St John is included. Enjoy personalized attention on this private tour of St. Thomas including a mini historical tour, beach time, and perusing the duty-free shopping options in downtown Charlotte Amalie. Round-trip private transportation included.